Hummingbirds, Facts and Information - The Hummingbird Guide. Hummingbirds have been our passion more than 30 years now. If you are a beginner and putting out your first feeder we will show you how to attract lots of hummers and keep them coming to your feeders year after year. As a seasoned enthusiast, you will find interesting up to date information that you "didn't already know", and products to enhance your experience and solve feeder problems that might occur. 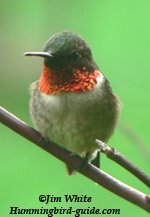 We (Jim & Ruth) built this website to share with You our first hand knowledge and offer a wealth of information, resources, tips, photos and products to enhance your hummingbird enjoyment. NOTE: We live in Vermont and have 14 feeders spread throughout our property. Our experience, observations, and research are what we share with you. Over the years this website has turned into a community of hummingbird lovers. We welcome you today and please visit regularly. NOTE TO OUR MOBILE VISITORS: This site is "Mobile Friendly". Add this page to the "Homescreen" of your Smartphone to have fast and easy access to our website. We hope to help you enjoy your little feathered friends more than ever, so stay a while and browse all the free information. If you have any questions feel free to contact us, we are usually able to answer inquiries promptly. Post your Sightings for 2019! Our New Hummingbird Migration Mobile App. Attract: Anyone can learn how to attract lots of these beautiful little birds, understand the different features of feeders, what Flowers are most appreciated by these tiny birds and how to plant a Garden for them. Facts: Read amazing and detailed facts such as the large number of species, the long Migration, and the essential Nourishment needed to make this long journey. Migration: See a Migration Map of sightings submitted by our visitors. 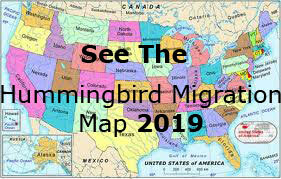 Follow the migration each year while anticipating their arrival in your areas. Photography: Our Photography section includes lots of gorgeous photographs, tips on how to photograph, and a gallery for your Photo Submissions. For the videographer visit our Video collection and submit your videos. Feeders: Find all types of Feeders including Basic, Decorative, Tray, Window and Unique in our Store. Discover practical Accessories such as Ant Moats, the Hummmer Helmet, WebCams and special Birdbaths. We can solve all your feeder problems with our Tips/FAQ. The Hummer theme has inspired beautiful Gifts. Art: These gorgeous birds inspire Poetry and Art. For the poets and writers, submit your poems and stories. We host ongoing writing Contests to encourage kids to learn about them. With beautiful iridescent feathers that reflect sunlight at certain angles, these tiny creatures are truly fascinating! You can sign up for "The Hummer" newsletter (on the left) to keep up with latest news, promotional discounts for our store, new products, contests, photos, and receive a FREE convenient printable nectar recipe. Sign up for our RSS Feed to the "Our Blog" to keep up with the latest additions to this site at the Top of the Page on the left. We are tracking the 2017 migration, fill out a form to help us with the Spring Migration by posting your sightings. Don't forget to click the "Social Networking Buttons" on the bottom of our pages to share and help our community grow!